Earigate is an at-home solution for earwax build-up. Its patented nozzle system, which flushes out earwax blockage back out the ear canal, was developed by a Canadian ENT. 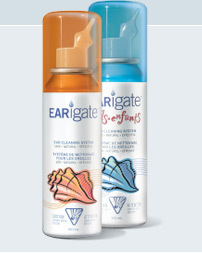 For children 6-12 years of age, try Earigate Kids! Impacted earwax should be removed by physician prior to using device. Solution should be stored at room temperature. Do not keep product in a cool place. If the solution is too cold, use of the product may cause dizziness. Keep away from children. Do not use with perforated eardrum or if you have had previous mastoid surgery. If pain or bleeding occurs, seek medical attention immediately. Do not use in children under six years of age.